This bag is perfect for day-to-day use. I personally do not think this is a "small" bag at all. You can get a LOT of stuff in this bag. it's VERY light weight and comfy. The fabric is lightweight, sturdy and water-resistant. The main area is divided into two very roomy main compartments, each of which has its own zipper access at the top of the bag. Each side has PLENTY of room for stuff . you can carry daily items on one side and leave the other side for papers, journal or small spiral notebook, sketch pad and pencils or an iPad. There's two more zippered compartments on the front of the bag so it's easy to keep things organized and easy to find. on the back of the bag, there is a zip pocket which can hold your important things. 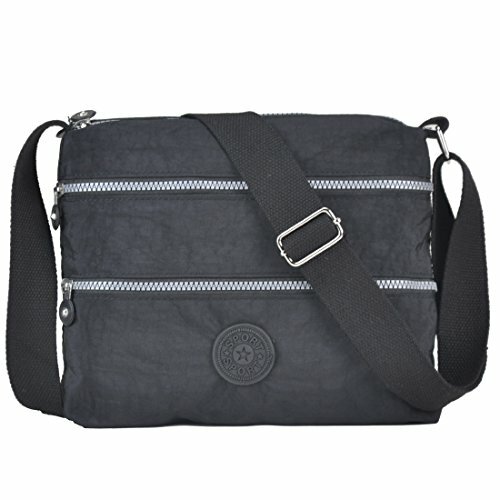 Every day and travel crossbody bag:Fashionable style, can be used as a handbag, shoulder bag or cross-body bag.with a variety of storage options & organization features, ideal for travel, errands, shopping, and diaper bag for parents on the go. If you have any questions about this product by Volganik Rock, contact us by completing and submitting the form below. If you are looking for a specif part number, please include it with your message.